Thanks for the good party Mike. 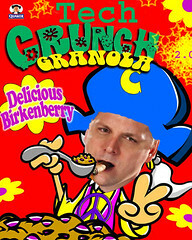 Mike Arrington just blogged about tomorrow's launch of Slidecasting by SlideShare. Slidecasting is a new media format, the combination of Powerpoint slides (everyone has the authoring tool) and audio (can be located anywhere), including podcasts (where it gets interesting). While I'm a biased advisor to SlideShare, you will have to agree that multimedia on the web just got a whole lot easier and accessible. And as objects you can socialize. If I was an event organizer or podcaster, I'd be setting up a group on SlideShare now. UPDATE: Made my first Slidecast. All it took was the time to listen to my 13 minute presentation while sliding some markers. The editor UI is really easy. Today the How To Wiki launched on WIRED, a collection of guides for how to Live, Work and Play better. Powered by Socialtext, licensed under Creative Commons, I have to say it is one of the better wiki implementations for a media brand -- and perhaps how things may be. Seeded with last year's and this month's issue of How To Guides from WIRED Magazine, it begins with the style and culture of WIRED. But how it goes from there is a page that hasn't been edited yet. It does differ in content and form from my other favorite how to guide wiki, wikiHow. How To guides, FYI, are also a very common use case behind the firewall for company wiki intranets (the biggest part of the Apple intranet, for example). This is a very ambitious project, bold for a media organization (remember Wikitorial?). I'm proud of the teams that drove this and look forward to something that could be a really fun community. Evan Prodromou dropped by for some coworking at Socialtext's Palo Alto office. The ability to do this search openly is part of the great culture we have built at Socialtext. I'm going to transition to Chairman & President and focus on growing the top line with my external facing duties and drive corporate and product strategy. CEO 2.0 will bring a strong operations background and have a mandate to grow the bottom line. This is a dream job. I'm just starting the search and you can help. We should be able to find the right person within our own strong network, so if you can make a strong recommendation please contact me through LinkedIn. We are looking to host the biggest BarCamp ever, on its third anniversary, at the place it started. 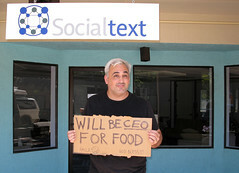 So far we have a date, August 18th and 19th, and location on the block where Socialtext is. Mark it, because with the help of neighboring companies, we might have room for 1,000 participants. Need case studies - have a few examples that we fall back on. Our store-houses of success stories needs to expand fairly dramatically if we are going to get traction with decision-makers within companies. What will help them make that decision is verifiable case studies. Need to make sure we don't keep using the same examples over and over. Mustn't get into the trap of coming up with impressive ROI numbers for these techs, Lots of these ROI numbers quoted are 200% - 300%, which makes people ask, if these are true then we should be throwing money into buying software. Those numbers have to be suspect. Don't want us to fall into the trap of coming up with glowing numbers. Can talk about what happened, at the anecdote or case study level. These are very persuasive. Not all companies have a rigid ROI view of investments, but what they want is ways to triangulate the quality of investment. Need to address this problem, need a repository of information. If and when we do this we need to throw the gates open as widely as possible - should be emergent, widely accessible, and egalitarian. Need to disclose where this information comes from - it's not automatically suspect when a case study comes from a vendor. Too often, we don't to basic levels of disclosure, so just need some disclosure rules about who's putting information up. Wikipedia has an elaborate set of rules, guidelines and policies which have emerged over time. Not sure what they set of ground rules is needed, but we'll come up with them over time. He volunteers to participate in this effort, what we need is a couple of technologists or vendors to provide environment; perhaps a wiki. Then everyone else throws information up, and structure will emerge over time, as will groundrules, but it would be an invaluable resource for all of us if there's a repository were we can point decision makers to so they can find valuable information. If you know of an E2.0 case study, please enter any and all details. We don't care if you were directly involved in the project or not, got paid for it or not, etc. We simply ask that you be as honest and forthcoming as possible, cite sources where available, and disclose your relationship(s) to the companies involved. This last point is critical. It's fine for a vendor or consultant to add information about one of their cases, and it's fine if that information is not verifiable from objective and/or published sources. It's essential, though, that contributors correctly and completely identify themselves and their relationships so that readers have the information necessary to make their own judgments about possible biases.